This summer palace was designed in the Italian style and ended up being the last residence built for the Russian imperial family, the Romanovs. It was the site of many significant events, such as the Yalta Conference, where leaders of the Allied forces met in 1945. 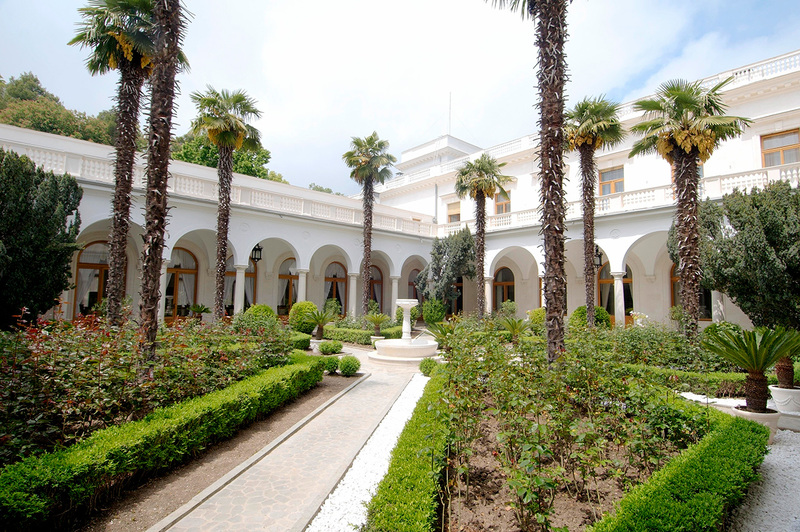 RBTH explores the rich history of Livadia Palace, the southernmost home of Russian royalty. Livadia is a settlement in southern Crimea, not far from the city of Yalta. The region is known for its healing climate and became a popular resort town, especially following the development of the railroads in the 19th century. In 1861, Tsar Alexander II bought land in Livadia and had the Grand Palace built there as a gift to his wife. Not long after that, the Minor Palace was built for Alexander III, the next heir to the throne, who visited many times and eventually died there. It was in Livadia, at the Church of the Holy Cross, that the last Russian Tsar Nicholas II ascended to the throne. In this same church, his bride-to-be, Princess Alix of Hesse and by Rhine, converted to Orthodoxy and adopted the name Alexandra Feodorovna. 2. The palace was the most expensive imperial "dacha"
At the request of Nicholas II, the original palaces were torn down and one giant palace was built in their place. This palace still stands today. According to estimates, the emperor spent up to four million golden rubles on the construction. The foundation was laid in 1910, and the building was complete after only 17 months. The imperial family typically vacationed in Livadia during the spring and fall. To get there, they would take the train from St. Petersburg to Sevastopol, and then board a ship, before eventually arriving at the Yalta port with great ceremony. The tsar, with his wife and children, would enjoy the healing air, go for walks, swim, sunbathe, go hunting, ride horses, and take drives in the countryside. The family also loved to play tennis and had a tennis court built. Photography was yet another passion. Today, there are still personal photographs from the imperial albums, which show images such as the Grand Duchesses posing in seafoam or the emperor and his entourage sitting on a large rock. The last time the imperial family visited Livadia was during the spring of 1914. World War I began later that summer and revolutionary activity commenced shortly thereafter, preventing further visits. The Livadia Palace was designed by Nikolai Krasnov, a Russian of peasant origin. By the age of 24, he was already a leading architect in Yalta and his work contributed to making Yalta the beautiful city we frequently read about in Russian literature and memoirs. More than 60 buildings in Yalta were constructed according to his designs, many of them villas, which were commissioned by aristocrats from the capital. Following the Russian Revolution, Krasnov and his family left the country and went to Constantinople and Malta before finally settling in Belgrade. He continued his architectural career there and designed a series of palaces, including one in Dedin, which was the residence of Yugoslavian King Alexander Karađorđević. The palace was built in the style of Italian Neo-Renaissance villas, with open patios, elaborate balconies and ornate interiors. White Crimean granite was used as the building material. The most "Italian" element of the palace is the inner courtyard, which is surrounded by arcades, full of greenery, and has a marble fountain in the middle. The patios have marble benches with armrests in the form of griffons. In the second half of the 19th century, a style known as eclecticism became very common in architecture and interior design. Architects began to integrate various styles and influences into the construction of one building. The Livadia Palace is an example of this mix. The second-floor private apartments of the imperial family were modern, while a Byzantine style was used for the church. Meanwhile, the two skylights were designed differently, one in the Gothic style with chimeras and the other in an Arabic style, featuring majolica tiles and oriental decor. After the Russian Revolution, the building was no longer used as a palace. In fact, during the Soviet era it became a sanatorium. Fortunately, some of the wonderful décor and interiors remain. These include Carrara marble columns and fireplace in the main dining room, a Jacob-style mahogany-paneled reception cabinet with brass finishing, an English-style billiards room and a handmade rug depicting Nicholas II with his family. Immediately after the Revolution, the palace briefly became a museum preserving the heritage of imperial family life. Later on, it served as a tuberculosis sanatorium for peasants and from the end of World War II until Stalin's death in 1953, the residence was used as a dacha for state officials. In 1993, the palace was reopened as a museum. The palace was the site of one of the most important political events of World War II, the Yalta Conference. This summit was attended by the three heads of state from the anti-Hitler Allied forces, and included representatives from the USSR, the U.S. and Great Britain. U.S. President Franklin D. Roosevelt and his delegation were given 43 rooms in the palace during the conference.